Admittedly, I’ve been torn about whether or not to post this review. I have this wine and another wine to write about from our vacation in August to Cape May, but in the wake of Hurricane Sandy, I wasn’t sure if this would be like pouring salt in the wound of a community that is hurting. I finally decided to post, though, because I see it more as a celebration of the fabulous beach town, the delicious restaurants where we dined, and the wonderful places we visited while there. 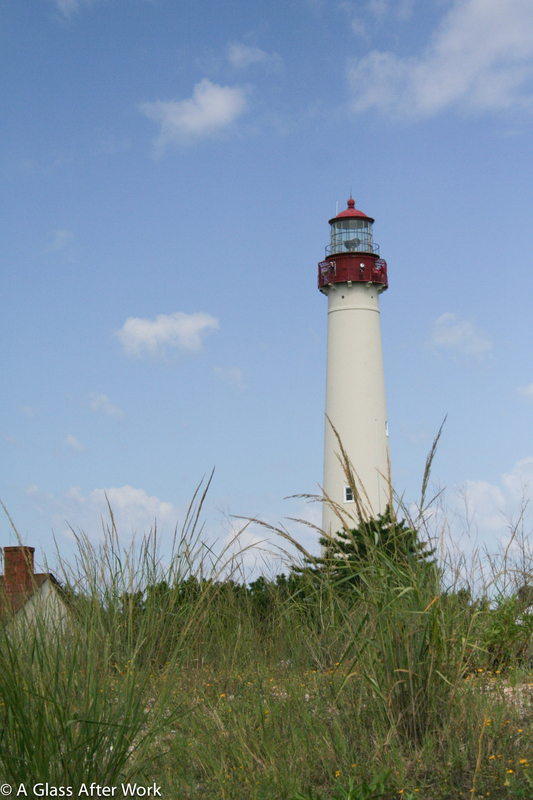 Mid-way through our week in Cape May, Hubby and I decided to leave the beach and spend the day exploring Cape May. 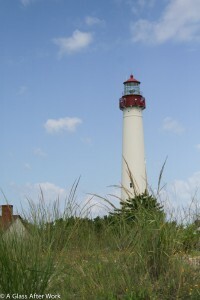 We started off at Cape May Point State Park, where we climbed the 199 steps to the top of the 157-foot-high lighthouse. It was well worth the climb for the gorgeous view of both New Jersey and Delaware. 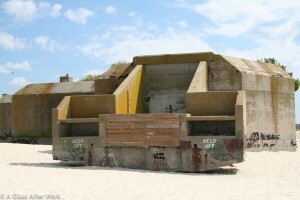 Once we had our feet back on the ground, we walked out onto the beach to explore the WWII bunker that was built as part of the Harbor Defense Project of 1942 when the area was still part of a military base. While we couldn’t walk inside the bunker, we spent a lot of time walking around it and taking pictures. It looks like something George Lucas built for the Star Wars Tatooine set! When we were done walking around the state park, we went whale watching with Cape May Whale Watcher. 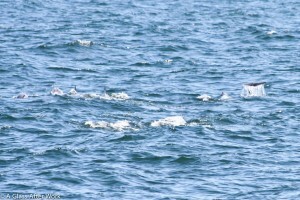 While we weren’t fortunate enough to see any whales, we saw numerous pods of dolphins, including one that was far from shore and had more than 100 dolphins. 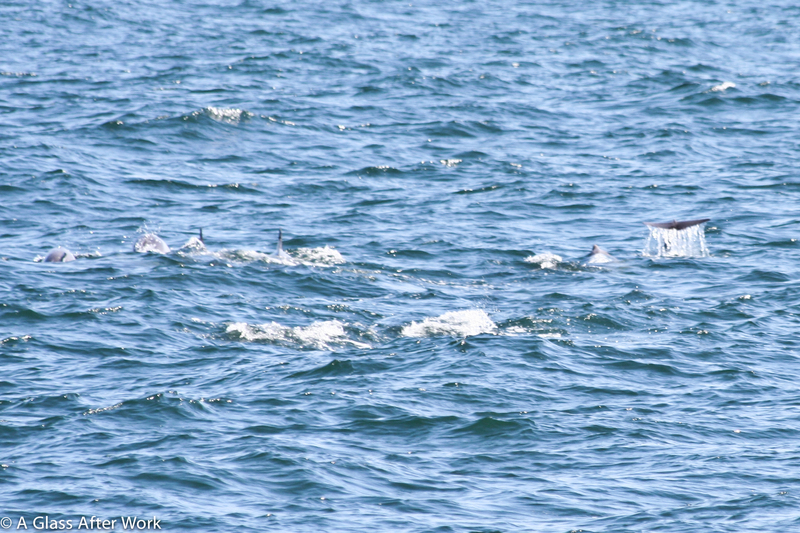 Hubby and I had both seen dolphins from the shoreline before, and he’d even been out in a boat that was running along the coast when he saw them, but neither of us had been that far out in the ocean or seen a pod that was that big. It was very impressive. After a great day exploring Cape May Point State Park and going whale watching, Hubby and I headed to The Lobster House for an amazing seafood dinner. The restaurant doesn’t accept reservations, so we made sure to get there just as they were opening, and the line was out the door. It was certainly worth the wait, though. I started off my dinner with the best baked clams casino that I’ve ever had, followed by fresh sautéed Cape May scallops. Admittedly, there was a little too much sauce on the scallops for my taste, so I would definitely ask them to go easy next time, but the quality of the scallops and the overall taste of the dish was outstanding. Hubby ordered oysters to start—a half dozen fresh Cape May Salts that he absolutely loved. His one complaint about the fillet of flounder that he ordered as an entrée matched mine—too much sauce. Otherwise, he said it was possibly the best piece of flounder he ever had. Sadly for me, the wine list was underwhelming, so I just grabbed a half bottle of Santa Margherita Pinto Grigio, which I had tasted before and knew would go well with the seafood. I saved the trying a new one for once we got back to the rental. The 2008 Trivento Torrontés Select (winery) is from Mendoza region of Argentina and was a medium golden yellow color. 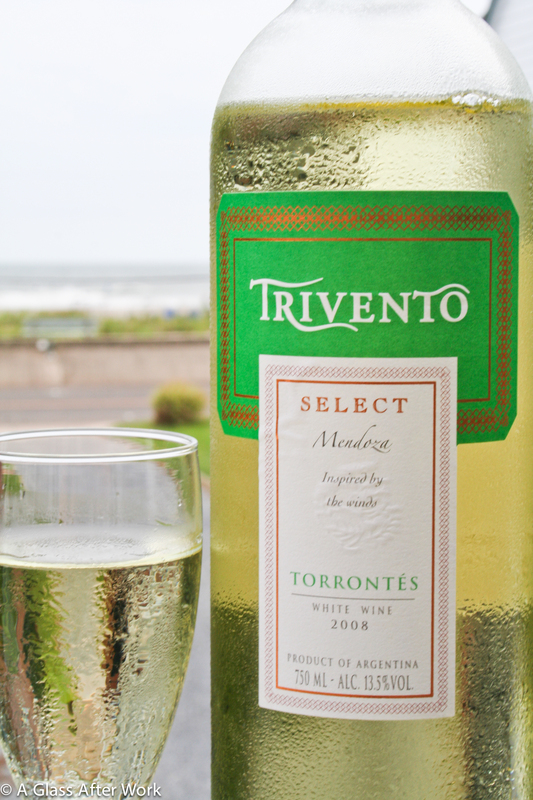 On the nose, the wine was almost sherry-like with stone fruits—peaches and nectarines—and white flowers. In the mouth, there were nectarines, limes, and a touch of salt and rose petals. The wine had a light-to-medium body. Is this worth a glass after work? Eh…if you have a bottle on hand, drink it, but I wouldn’t go searching it out either. At $12, I thought this wine was ok. I wonder if this vintage is a little passed it’s prime or if there were some storage issues at the liquor store because the sherry-like quality struck me as something that was a little off. That said, I didn’t feel like I wasted my money, as I certainly enjoyed a few glasses while sitting on the porch listening to the ocean. It went particularly well the carrots and Mediterranean hummus I was snacking on while drinking the wine. Overall, I probably wouldn’t buy this vintage again, but I would definitely like to try a more recent vintage to see what this wine can really offer. Question of the Day: In celebration of the areas just hit by Hurricane Sandy…have you every been to the New Jersey Shore or the DelMarVa beaches before? If so, where did go and do you have a good story/memory you’d be willing to share?